SA Tool Electronics was founded in 1973 by Guenter Schmitz, the Managing Director, as a supplier of industrial electronics equipment and related services. In the early years, the company focused on establishing itself in the market and concluded numerous agreements, many of which remain in existence today, with European and USA-based companies. In 1980 a relationship with Robert Bosch GMBH/ Germany, which has lasted nearly 30 years, began with an agreement with SA Tool Electronics to maintain all their industrial automation equipment in South Africa. This relationship flourished and, in 1982, Flexible Electronic Systems (Pty) Ltd. was established as an import agent and supplier of OEM equipment. The next 16 years saw active growth and expansion as the company became more sales orientated and diversified in response to local demand. CAM packages for the sheetmetal sector (CNC punching, nibbling, laser/ plasma cutting). With the decision to enter the software market, local distributorships were acquired from a number of computer hardware and computer peripheral suppliers. Software and hardware products for the CAD/CAM and CIM/DNC market. The refurbishing of machine tools of all kinds, and the design and projecting of special purpose machines, as well as automated production equipment. SA Tool Electronics could now offer complete solutions for computer integrated manufacturing in the metal forming industry. More emphasis was placed on turnkey projects in automation of production processes, with increased sales of Bosch PLC equipment. From 1996 - 1999, SA Tool Electronics directed its focus to the design and integration of special purpose machinery for the local engineering industry. It now provided engineering, planning and consulting for the upgrading of existing production equipment, as well as assistance with the integration of the latest technology on equipment designed by its clients. The company was also the sole distributor of Bosch Automation Equipment and represented the division BOSCH ATS of Robert Bosch Gmbh, Germany in Southern Africa. 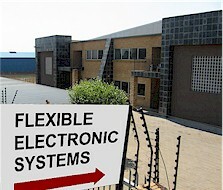 In 2000, SA Tool Electronics merged with, and began trading under the name of, Flexible Electronic Systems. The product range continued to expand with lower-cost options in motion controls being introduced to offset a weak Rand at the time. The same year, the company was sold to Streamworks, a listed company, which was taken over in turn by DNA Supply Chains. However, DNA felt that Flexible Electronic Systems did not fit in with its core business, and Guenter Schmitz bought back the company in 2003. In 2007, shares in FES were sold to long-standing management to comply with new legislation and the Employment Equity Act. The company currently specialises in system design and integration with the main focus on automation of production plant and machinery including the design and manufacturing of special purpose machinery. An additional focus is the supply of motion control systems, measuring, robotics and sensing devices comprising the relevant hardware, software and system integration. Flexible Electronic Systems represents a large number of well-known European, American and Eastern manufacturers, and prides itself on the wide variety of quality products, excellent service and fast turn-around time it offers.